It may seem quite surprising but the bacteria in our gut can tell us a huge amount about our physical and mental health. Just like your fingerprint, the make-up of bacteria in the gut is unique to each of us. In fact, although we share around 99 per cent of our DNA with other people, we only have about 10 per cent of the gut bacteria in common. These tiny little microbes can influence whether or not we suffer from, or are saved from, conditions like heart disease, diabetes, depression and even obesity. As mentioned in Mad Diet, there is now a strong scientific link between the health of the gut and the health of the brain. In fact research linking probiotics to improved mental health goes back to the early 1900s. Good bacteria in our gut increases levels of tryptophan, an amino acid that’s required to produce serotonin in the brain – the happy hormone. Plus the different species of gut bacteria are essential for digestion so that our body can produce and absorb vitamins. Microbes also affect our mood. The enteric nervous system (ENS) has been referred to as our second brain and has up to 600 million neurons – equal to the number of neurons in the spinal cord. Emerging studies have shown that intestinal bacteria directly communicate with the central nervous system by way of nerve fibres and the immune system. Studies have shown that even minute doses of good bacteria in the gastrointestinal tract are capable of influencing neurotransmission in the hypothalamus – the part of our brain which regulates mood and emotions. Probiotics reduce inflammation (a precursor of many diseases). They help us manage our weight by controlling the amount of energy we extract from food and by helping to regulate our blood sugar levels after eating. These amazing little organisms can literally determine whether we get sick or stay healthy and they have a major influence on our brains and waistlines. A study published in the peer-reviewed journal Obesity, is one of many studies confirming the link between balanced intestinal flora and weight loss. Researchers at Virginia Tech University discovered that good bacteria in the gut reduced the absorption of fat. Study participants were split into two groups and all followed a high-fat diet for four weeks. They were also given milkshakes to drink. 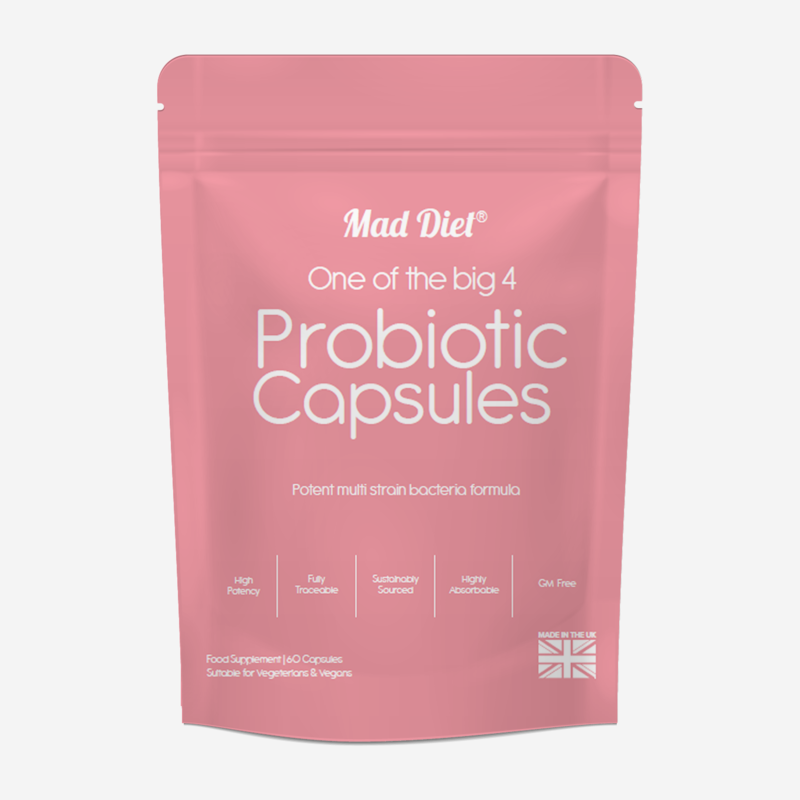 One group had probiotics, including Lactobacillus acidophilus and Bifidobacterium longum, added to the shake, whilst the other group drank a placebo milkshake. Those who were taking the probiotic milkshake alongside their high-fat diet put on significantly less weight than those consuming the placebo milkshake. Another study published in the Journal of Clinical Investigation in 2014 showed that mice fed probiotics didn’t eat so much and had significantly reduced body fat and fatty liver, compared to the mice that did not receive probiotics. And in the British Journal of Nutrition a study reported that women who took a probiotic every day during a 12-week weight loss diet lost more weight than women who did not take the probiotic. Even setting aside our mental health and weight issues for a moment, probiotics may also be our salvation in combating antibiotic resistance. A recent report from the European Centre for Disease Prevention and Control (ECDC) presents a stark warning on the increase in antibiotic-resistant bacteria in animals, food and us. In fact 60 per cent of human gut bacteria are now resistant to antibiotics – partly due to the overuse of antibiotics in medicine and factory farming. Experts believe we are on the cusp of a public health disaster far greater than climate change or even nuclear war. And yet governments are still dragging their feet around animal and human antibiotic use. The good news is that probiotics can help to minimise the antibiotic-resistant bacteria in our guts. By taking daily doses of probiotics we populate our gut with good bacteria and stop the bad bacteria multiplying out of control. The good bacteria in probiotics also help us to absorb vitamins – so we absolutely must ensure our gut has enough. Probiotics are naturally present in certain yoghurts, fermented milk and kefir (a drink made from fermented milk), olives and sauerkraut – the stuff Germans eat with just about everything! But not everyone likes sauerkraut, olives and kefir – my son certainly won’t touch any of them!